The Sports Car Challenge meeting at Most in the Czech Republic saw action on and off the track: it does not happen every day that a race has to be postponed for helicopter damage. The sportscars were a support series for the European Truck Racing Championship weekend on the Czech circuit, and a healthy crowd was on hand on a rainy and windy Saturday. It was dry for the first qualifying session, which established the grid for race 1, to be held later in the day. The season-long confrontation between Wolfgang Payr and Tony Sinclair continued on the 3.4k long track, not far from the Czech-German border; some 0.145 seconds decided the battle for pole position, in favour of the Austrian and his Cosworth-powered PRC. In third spot on the grid, Pius Truffer again seemed to have it all his way in division 2 while in the GT class, with a field of seven cars on hand for this weekend, Klaus Stanek in his 996 Cup had the upper hand over the GT3-R of Philipp Zumstein. In his first year of racing, Olympic and World Cup ski champion Patrick Ortlieb made his series debut, another retired Austrian wintersports hero to make the transition to four-wheeled competition. He did all right for himself, with a fourth place in class in each of the two races. Shortly before the Saturday race, two things happened: a) it started to rain, and b) a helicopter took to the skies to provide aerial shots for the TV coverage of the truck race. The pilot decided to turn this into air-to-ground combat, with a series of ultra-low “strafing runs” over the paddock area that sent tents and equipment flying, and even knocked a few people to the ground. In the light of the damage caused by this rather irresponsible behaviour, the SCC race was postponed; the teams managed to clean up the gravest mess, and still get their cars ready to race within 20 minutes. Those drivers who put their money on slicks for this 15 lap race lost. It rained harder as the race progressed, and pole sitter Wolfgang Payr made full use of his advantageous position. Aided by the fact that his main rival, Briton Tony Sinclair in the Jade-IES, had to come to terms with a new car not previously raced in such conditions, the Austrian put some 16 seconds between himself and the field, and drove the race win home in solid fashion. With Sinclair safe in second place, the main battle of the race was for the lead in Division 2, and third place overall. Karl-Heinz Matzinger in the Hoffmann Racing PRC, had an excellent start and took the lead from Pius Truffer, the fastest qualifier among the “Lights” field. Lap 2 saw Matzinger dropping down the order following a spin, he then worked his way back up the leaderboard, and eventually got up to third in class. 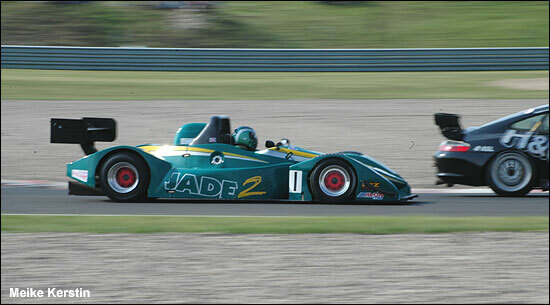 Truffer then remained, closely shadowed all the way by sportscar rookie Jörg Peham in the PRC-Honda. 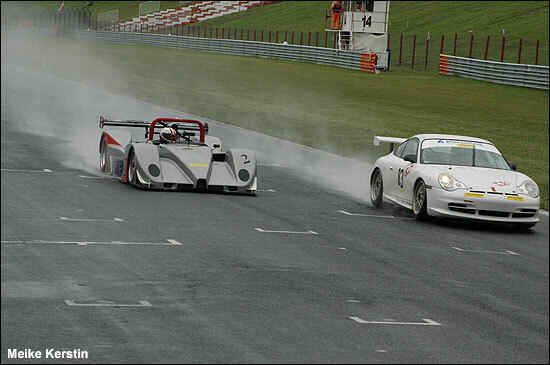 Peham had previously only raced Porsches but adjusted very well to the sports prototype. In Division 4, the all-Porsche GT class, Austrians Klaus Stanek and Martin Sagmeister won from Switzerland’s Peter Bernhard, all driving 996 Cup Porsches. 11. Peter Bernhard/CH, Porsche 996 Cup (3. div.4), -1 L.
14. Gregor Fischer/CH, PRC-BMW, -2 L.
19. Carlo M. Bermes/D, PRC-Opel, -6 L.
20. Adi Gärtner/D, Martini-Alfa, -13 L.
The skies looked friendlier, and luckily devoid of any helicopters, for race 2 on Sunday. Qualifying was won by Tony Sinclair, from Payr and the third main combatant in Division 1, Gerd Beisel with his PRC-BMW. Peham in the little 2l Honda-engined PRC was right alongside Beisel on row 2, and Zumstein as the fastest of the GTs, taking advantage of the GT2 car’s extra power in the dry conditions. And it stayed dry all afternoon - until minutes before the SCC race. Again the tyre drama unfolded as some drivers went for wets or intermediates, others stayed on slicks. The latter didn’t have a hope of defending their places during the initial phase of this 12 lap race, as Tony Sinclair found out: while Payr’s silver PRC sped away in the lead, the green Jade moved down the order. Beisel and Peham gave chase as the sun came out and the track started to dry up quite rapidly. Suddenly, those on “wets” found themselves in trouble. While the eventual GT winner, Kurt Peter in his Porsche 996 Cup, hung onto his lead until the end, Pay’s lead began to melt like ice in the sunshine. From somewhere in mid-field, Sinclair re-appeared in the top 6, then the top 3. Going into the last lap, he was 10 seconds down on Payr; coming out of the last corner, he was in the lead. Punching the air in jubilation, the Briton celebrated a spectacular win in the closest finish of the weekend. With Beisel in third place, the overall podium was exclusively a Divison 1 affair; Jörg Peham crowned his first weekend of sports prototype racing with a fine class win in front of Karl-Heinz Matzinger who had started from pit lane, and Beisel’s team mate Gerhard Münch in he Norma M20. Kurt Peter, Martin Sagmeister and Philipp Zumstein made up the GT podium, with Patrick Ortlieb again in an unrewarded fourth place. 8. Mirco Schultis/D,PRC-Honda , -1:09,439sec. 12. Philipp Zumstein/CH, Porsche 996 GT3-R (3. Div.4), -1L. 19. Rudi Hämmerle/A, PRC-Honda, -3L. 20. Carlo Bermes/D, PRC-Opel, -4L. The Sports Car Challenge returns to the Czech Republic on September 23/24, for two races at Brno.